In the previous post, we checked out z88dk Programming Setup. The z88dk is a portable Z80 / C cross compiler that targets hardware such as the 8-bit video games console: the Sega Master System (SMS). 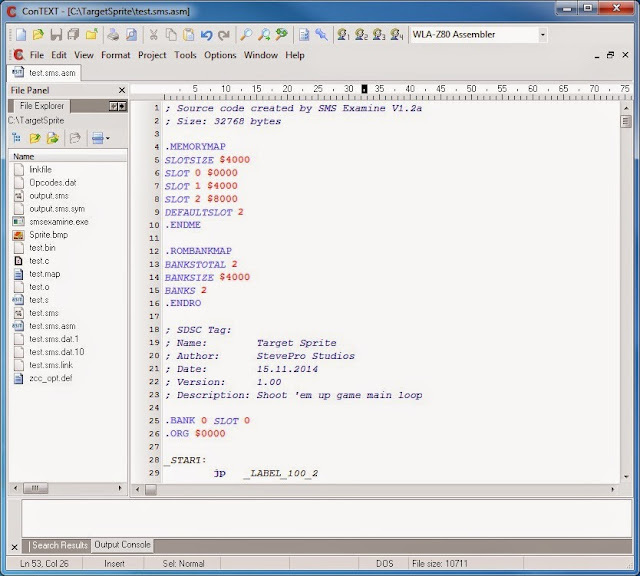 Using z88dk, it is possible to write game code in high level C language rather than pure Z80 assembly. Therefore, we would now like to extend this knowledge and write more detailed programming sample. Graphics on the Sega Master System are built up from four things: Palette, Tiles, Tilemap, Sprite table. 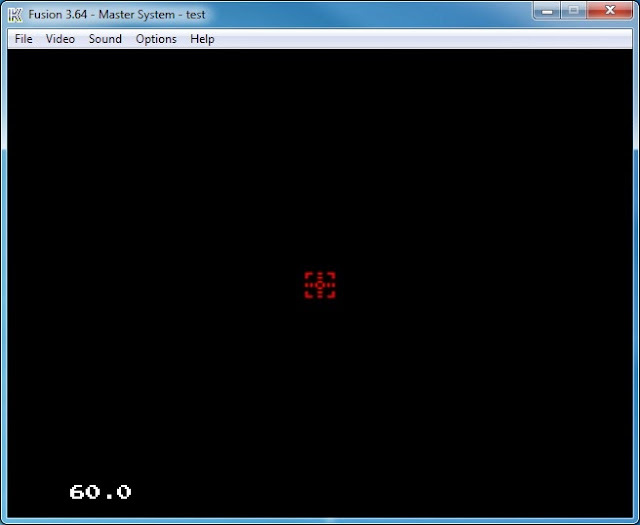 In our example, convert target sprite into a programming format the Sega Master System understands. 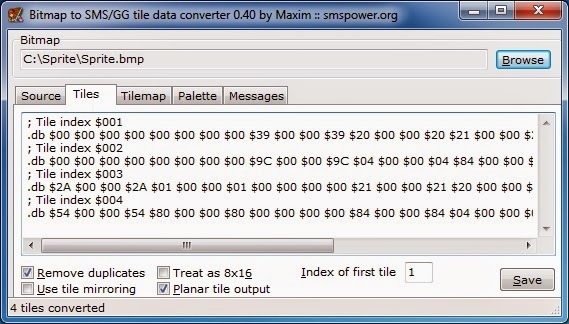 Here we will use the BMP2Tile utility from Maxim to convert the 16x16 pixel target sprite into SMS data. Download and launch BMP2Tile. Drag n' drop 16x16 pixel target sprite onto open "Source" tab. Set "Index of first tile" to 1. It seems best practice to leave empty background tile at index 0. Choose "Tilemap" tab. 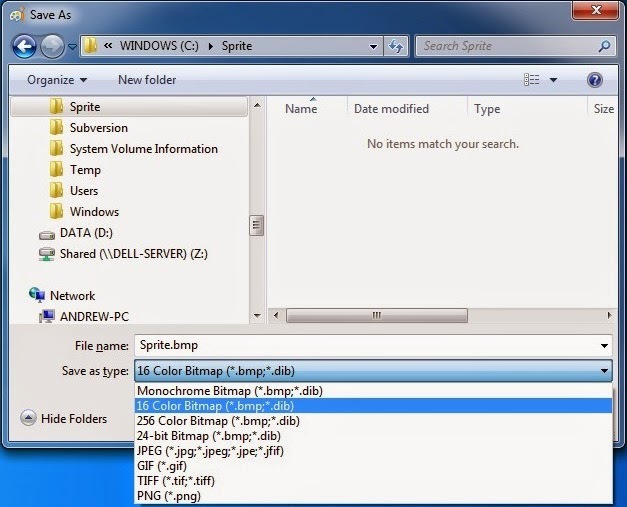 Leave "Use sprite palette" and "In front of sprites" options unchecked. Click Save button on "Tiles", "Tilemap", "Palette" tabs. All data here is used in the game code. As an example, let's build on the existing test.c program found here at C:\z88dk\examples\sms. First, create new directory: C:\TargetSprite. Next, add the following 2x files: test.s and linkfile. 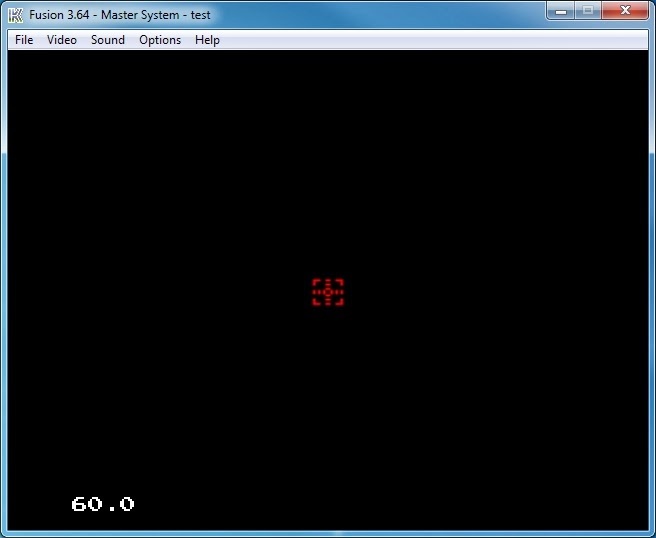 .SDSCTAG 1.0, "Target Sprite", "Shoot 'em up game main loop", "StevePro Studios"
.COMPUTESMSCHECKSUM           ;compute sms checksum for this rom. Launch Crimson IDE. File | New file. Save test.c. Next, type in the following source code: test.c. // priority, x, y, tile. // array, start, count, bpp. If you have C:\PerfomBuild.bat setup as per previous post then simply hit Ctrl+1 hot key to run! Note: move target sprite left, right, up or down. Press "Fire2" button to double movement speed. Finally, disassemble the compiled binary file test.sms generated from the Crimson IDE batch script. 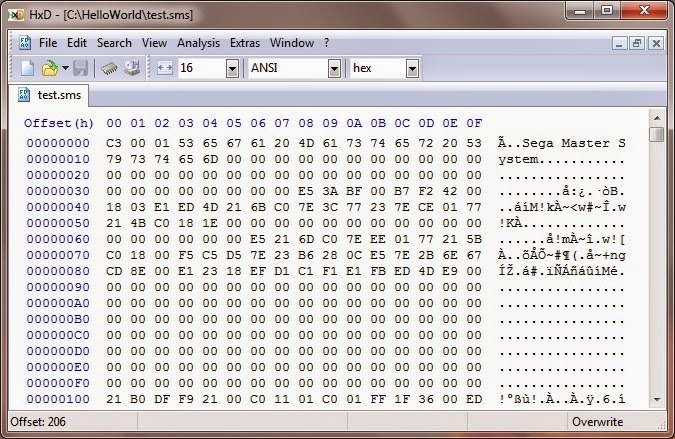 In directory C:\TargetSprite, copy the 2x files Opcodes.dat + smsexamine.exe from SMS Examine zip. Launch command prompt, change directory cd C:\TargetSprite. Type: smsexamine.exe test.sms. Follow instructions from the previous post to setup hotkeys: F9 (compile) F10 (run) F11 (debug). Press F9 to compile and link "test.sms.asm". This generates the "output.sms" binary file. 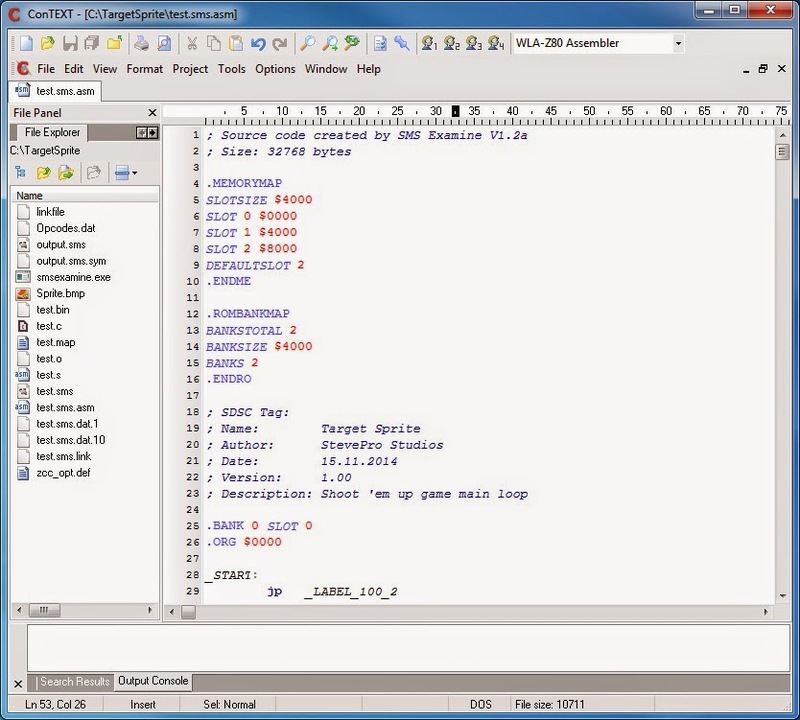 Compare machine code in the debugger with the raw binary output file from test.sms. 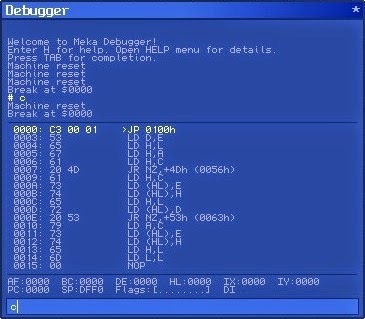 This simple programming sample creates building blocks necessary to produce an 8-bit video game for Sega Master System. The next steps would be to build an 8-bit Homebrew video game to completion!